The following is an updated version of a multi-service manual for the U.S. military's support of civil authorities in national emergencies. For more information on the manual and changes made in this version, see Steven Aftergood's post on the Secrecy News blog at the Federation of American Scientists. This publication provides procedures for actions taken by DOD components when directed to support local, territorial, state, federal, or tribal agencies responding to domestic emergencies. Support can be: expertise, equipment, personnel, plans, organization, communication, training, or other resources. 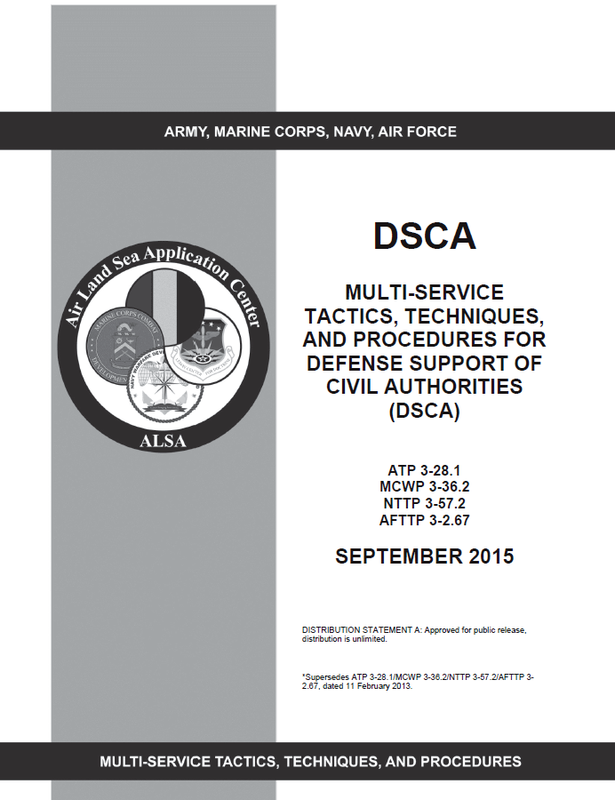 This publication establishes MTTP applicable to DOD components tasked with supporting domestic incident response, including: natural or man-made disaster response operations, national special security events (NSSEs), or support to law enforcement. This MTTP enables DOD organizations to integrate their capabilities with civil authorities into response operations. The focus of this MTTP is on those DOD forces serving in a Title 10, United States Code (USC) role. National Guard Civil Support in either a Title 32, USC or state active duty role are discussed, but are not limited by the discussion within this MTTP. a. A cyberspace-related incident of national significance may take many forms, including an organized cyber-attack, an uncontrolled exploit (e.g., virus or worm), a natural disaster, or other incidents capable of causing extensive damage to critical infrastructure or key assets. b. Large-scale cyber incidents may overwhelm government and private-sector resources by disrupting the internet and taxing critical infrastructure information systems. Complications from disruptions of this magnitude may threaten lives, property, the economy, and national security. Rapid identification, information exchange, investigation, and coordinated response will mitigate the damage. c. During DSCA operations, state and local networks operating in a disrupted or degraded environment may require DOD assistance. Services support the remediation, restoration, and protection of critical emergency telecommunication networks and infrastructure. Cyberspace technical assistance may be provided in response to a request from a lead federal agency. d. For more information on cyberspace operations, see JP 3-12, Cyberspace Operations and USNORTHCOM CONPLAN 3500-14 DSCA. a. To unify the military response, federal law permits a DSC to command federal military personnel in a Title 10, USC status and NG personnel in a Title 32, USC status or on SAD. Simultaneously, the DSC holds two commissions: state and federal. The commander then commands both Federal and state forces to coordinate the military response and provide unity of effort. b. In accordance with Title 32 USC § 325(a)(2), a NG DSC requires the approval of the POTUS (this authority is currently delegated to SecDef) and the consent of the officer’s governor to serve in both duty statuses. For an active duty commissioned officer, pursuant to 32 USC § 315, the Secretaries of the Army or Air Force may detail regular officers to duty with the NG, and with the permission of the POTUS. The detailed officer may accept a commission in the NG without vacating his or her regular appointment. The state or territory will commission the officer in its NG to command its NG forces serving under state authority. State law will dictate the requirements and procedures for the appointment and, typically, require the governor’s consent. c. A DSC operates two chains of command simultaneously. The DSC exercises command on behalf of, and receives separate orders from, a federal chain of command and exercises command on behalf of, and receives separate orders from, a state chain of command. As such, DSCs typically establishes their own subordinate federal and state chains of command, having Title 10, USC and Title 32, USC or SAD staffs. 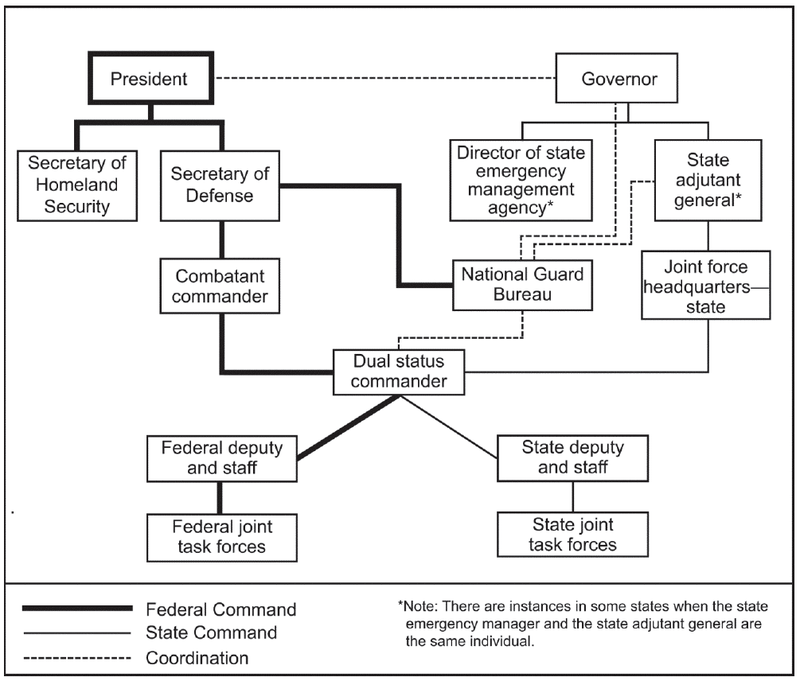 The subordinate officers and military forces operate in only one status, either state or federal. See figure 7 for an augmented DSC chain of command structure.